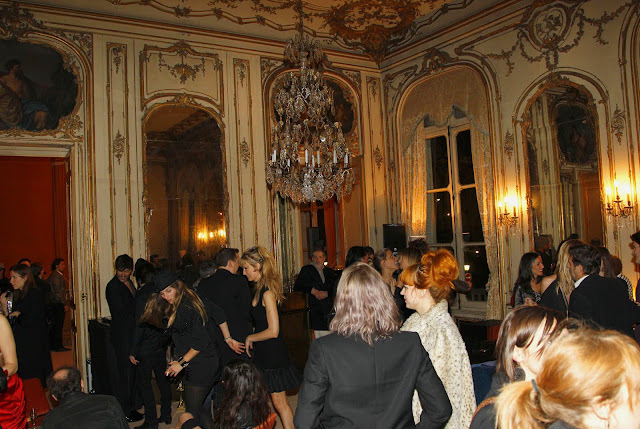 Here is a pic of where I've partied last week in Paris, rubbing my XL Margiela shoulders with the French crème de la crème, it was quite something. If you look closely you can see me. It all took place at the private mansion (my answer to 'this is all owned by one man' was simply 'show me this man!') at 34 Avenue Foch. The minute I heard the address I knew I would find some connection to Miu Miu, it just sounded so quirky-posh. At this same place, the SS 07, second ever in Paris, took place. There are chandeliers, there are mirrors probably scratched by mistresses, checking if the diamonds the lovers gave them were real. But most of all there were this people just having good ol' fun and champagne of course. Now is as good as a time as any to tell you who the hostess was and the mystery model I went to interview: it was... Eva Herzigova. She designed the capsule collection for the French fashion house 1.2.3.Paris and this was the launch party for all her friends and, well, me. On the decks for the night were Alice Dellal and Frédéric Beigbeder, I didn't know he was a DJ now, but I guess these days you just have to do something if you are a socialite. Thanks everyone at 1.2.3.! Ste me že našli na fotki? Več o mojem čveku z Evo Herzigovo v sobi hotela Crillon, ja, THE Crillon, v naslednji številki Elle, njeno 1.2.3. kolekcijo pa že najdete na obešalnikih. Če se vrnem na zabavo, najbolj me je navdušilo, da so vsi poplesavali, ko sta Beigbeder (kako zelo me nekaj na njem spominja na L. Novaka) in Dellal vrtela vrtoglavi miks devetdesetih, zraven sta sicer imela še tehnika, ki je potem vse našraufal tako, kot mora biti, ampak ves uspeh večera je bil v občutku fantastične domače žurke na nadrealistični lokaciji in z živo rdečimi ustnicami Eve Herzigove dva ča-ča-ča koraka stran.